@GMKnowBoulder answer the q: why is food (organic) with 1000s of changed genes safer than biotech with 1-3? Can you believe that they still didn’t answer? Actually, I do. Because to answer truthfully would undercut their claim that GMOs are dangerous on account of 1-3 additional genes. Their reply to this last tweet was to call me “Sir Pesticide”, accuse me of using science to impress my GMO peers, and finally closed with: “Be gone with you!” How mature. Frankly, I don’t expect them to ever see how ride the anti-GMO position is with contradiction, false knowledge, and uses ideology to counter evidence. How is that for intellectual consistency? Rather, blatant hypocrisy, with a side-serving of cognitive dissonance. Somehow, indeed. It’s too bad that organizations like GMKnow is so far down the rabbit of baloney, they couldn’t turn around to save their lives. If they could, they might actually make the world a better place. Instead, they’re making it worse. 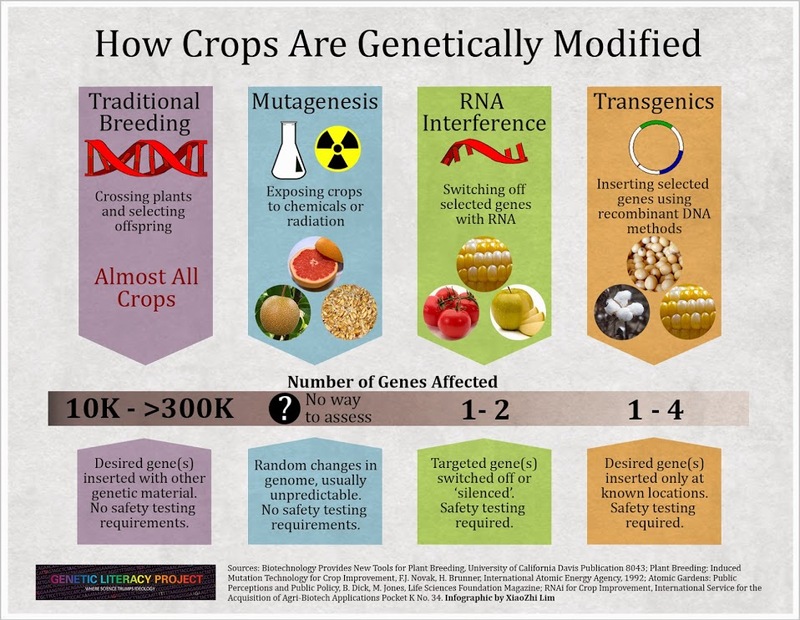 I would add that “mutation breeding” is much more concerning than genetic modification, as induced mutations are much less predictable. I wanted that left unspoken. Let them connect the dots themselves, but yes, it is. Remarkable how a culture can mold your risk perception and get it so wrong. Sir Pesticide! Funny for Grade 3, I guess. You should pen an OPED for the NYT’s. Use the in-line of “skeptic-come-convert.” Keep it under 1,000 words, and you never know. If it lands at the right time it might just be taken up, and believe me, you can write a hundred-times better than most of the OPED crap i’m dealing with. I’ll probably be in Sao Paolo mid-way through the World Cup (25-29 June). You making any trips out to the big, evil city? 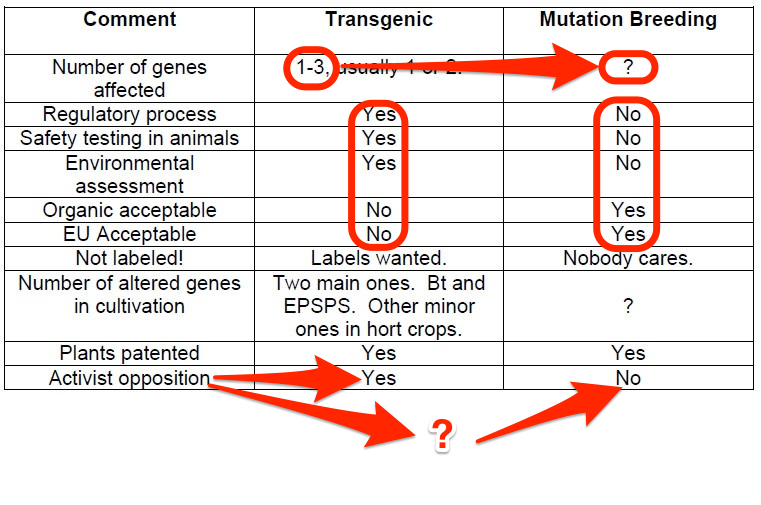 At least they admit mutagenesis is akin to GMOs, but the organic companies upon whom their existence relies cannot afford to have all the consumers whom they’ve now so flooded with disinformation about GMO safety find out that so many of their products are by their own definitions ‘not found in nature’ Frankenfoods. Organic foods are not “GMO-free” nor are they produced without the pesticides, antibiotics, or hormones they so frequently disparage in advertising and via their funded anti-GMO campaign partners like Organic Consumers Association. Loopholes abound in the organic production system but such truths are never even whispered by organic marketing gurus like Stonyfield CEO Gary Hirshberg. Mutagenesis is just another fracture in the organic fairy tale foisted upon the public via multi-billion-dollar black marketing campaigns according to a recent report by Academics Review: http://goo.gl/fWWsZn And the Organic Consumer Association’s petition shows their real desire has little to do with organic, food safety or the environment. Groups like this are no more than anarchist disruption agents hell-bent on using food fears to achieve a deep-ecology misguided return to pre-industrial society. You would think those funding Organic Consumers Association like Stonyfield Organic, Organic Valley and others paying them to push GMO labels while they denigrate the safety of competing, less-expensive conventionally grown foods would realize this and the slippery slope they’ve created by such dark alliances. Fear profiteers who live in glass houses shouldn’t throw stones. Wow, that is great news! That should discombulate the rank-and-file severely if it ever turns into a disivise issue, though, I have my doubts it will break them apart (one can wish though). I think, if such an event will ever happen, it will be after ‘the final war’ against GMOs and it needs to be won too. Nice closing paragraph, but I don’t think they would see it at all. People in marriages of supreme convenience never see more than a few steps ahead, so caught up in emotion and the moment. I hope this split really does come. As a progressive, I have a number of friends who buy in to the anti-GM propaganda. The ‘herd mentality’ and ‘group-think’ is hard to break. It is damn near impossible to break, unfortunately.